Dear Readers: This is the final posting in a series of political science forecasts for the 2016 races for the White House and Congress. James E. Campbell, author of the new book Polarized: Making Sense of a Divided America, has assembled presidential and congressional forecasts from eight different individuals and/or teams this year. They were gathered for a symposium to be published in PS: Political Science and Politics, but are available first here in the Crystal Ball. The models are based on factors such as the state of the economy, polling, whether an incumbent president is running for reelection, and other indicators. They can often be a better predictor of the eventual results than polls alone, and many are finalized months before the election. We are pleased to feature the work of the many top political scientists who have built these models, both in an attempt to predict the outcome of the election and, more importantly, to identify the factors that actually affect presidential and congressional races. The details and predictions of the final set of forecasts is presented below along with an updated table of all the presidential and congressional forecasts in this series. An early look at the articles offering more history and details about the forecast will be available at the PS website as soon as they are available. Our approach has shown its accuracy by correctly predicting the two-party result for both the popular vote and the Electoral College vote in 2004, 2008, and 2012. Predictors: ΔU: The change in state-level unemployment rate from the month after the president was elected to the month prior to the next election; PJA: president’s job approval (when the president is running for the second time and when the incumbent candidate is a “newcomer”); PPI: partisan pattern indexes (for Democrats or Republicans, we distinguish historical strongholds, e.g. partisan stability over 1952-2012, from those which are considered as “new” strongholds over 1989-2012); OPPVP: opposition nominee vote share at primaries (state level); dummies (among which a dummy =1 [0 otherwise] if an independent candidate is running). Toss-ups: four states representing 58 EVs (FL, OH, NM, AND NV). 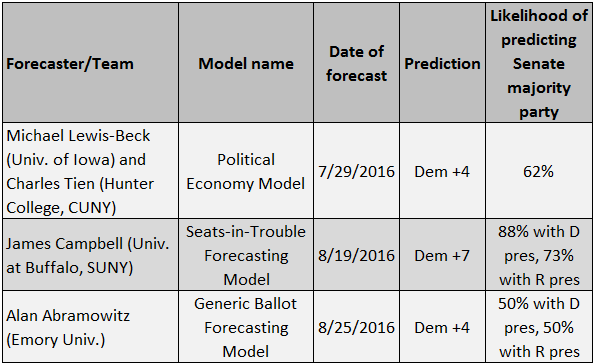 There are two companion presidential election forecasting models based on the preference polls and election-year economic growth. The two models are the “Labor Day Trial-heat and Economy” model and the “Convention Bump and Economy” model. 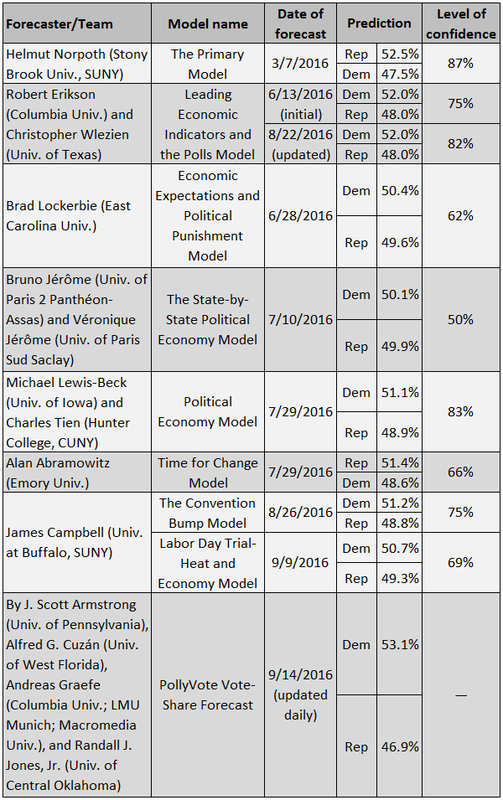 The models predict the national two-party vote percentage for the in-party presidential candidate. The models are essentially sophisticated readings of the preference polls, taking into account the historical adjustments made for the competitive fall campaign, the economy, and incumbency. Both models have been estimated using data for elections from 1948 to 2012, excluding 2008 because the Wall Street meltdown of financial institutions violated the models’ assumption that no unanticipated cataclysmic event intervenes between the forecast and the election. A forecast was produced from the Convention Bump and Economy model on Aug. 26, when the Bureau of Economic Analysis released its second estimate of real GDP growth in the second quarter of 2016. That forecast was that Clinton should be expected to receive about 51.2% and Trump 48.8% of the two-party national popular vote. 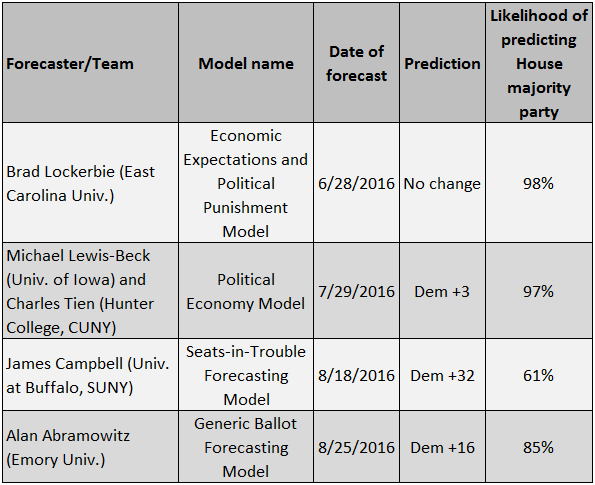 The forecast reported here is from the Labor Day Trial-Heat and Economy model, developed in 1990 with Ken Wink and later modified to reflect the difference between incumbent and open-seat contests. With the exception of the 2008 Wall Street meltdown election, the mean absolute error of this model in the five other elections in which it has actually been used is less than two percentage points. In 2012, this model predicted the 52.0% Obama voter percentage to the first decimal place. The median out-of-sample error for the model is one percentage point. The Labor Day Trial-heat and Economy model employs two predictors. The first is the two-party percentage of support for the in-party’s presidential candidate at Labor Day. Gallup data has been used for the preference polls in elections since 1948. The second predictor is the second quarter annualized change in the real GDP. The originally released economic data was used in the estimation when it was available. The late August (second estimate) GDP growth rate is used. In order to take into account the differences between incumbent and successor in-party candidates, the GDP data are centered around a 2.5% growth rate and then halved for successor candidates. The 2016 election poses one problem for both trial-heat models. The trial-heat data used in previous elections had been collected by the Gallup Organization. They had collected trial-heat data in presidential elections since 1936. Gallup, however, has not reported trial-heat data to this point in 2016. In lieu of the Gallup trial-heat data, I have used the median of the seven national polls reported on RealClearPolitics closest to the date at which the Gallup reading would have been taken. The Forecasts: Based on 51.2% of the two-party Labor Day week preference polls (a 44% Democratic to 42% Republican split) and a weak 1.1% real GDP growth in the second quarter of 2016, the Labor Day Trial-Heat and Economy model’s forecast is that Hillary Clinton should expect to receive 50.7% of the two-party national popular vote to 49.3% for Donald Trump. The forecast was made on Sept. 9, 2016, 60 days before the election. Uncertainty: Based on the distributions of out-of-sample errors for previous elections, the Labor Day Trial-Heat and Economy’s probability of correctly forecasting that Clinton will receive more than 50% of the national popular two-party vote is 69%. The probability that Trump will receive more than 50% of the national popular two-party vote is 31%. Description: The PollyVote (updated daily here) uses the evidence-based principle of combining forecasts for greater accuracy. It is not an explanatory model but a method for aggregating information from multiple sources used for forecasting the outcome of a presidential election. Analogizing from biology, it is a form of commensalism. By averaging all available forecasts within and across different components, this method cancels out the errors associated with individual forecasts. It is updated continuously, usually at least once a day, as new information becomes available. Since its launch in 2004, the PollyVote has demonstrated the benefits of combining. The Mean Absolute Error for 100, 60, and 30 days ahead of the election, across all three elections over which it has been calculated, is less than 1.0 percentage point. Predictors: trial-heat polls, the Iowa Electronic Market vote-share market quotes, citizen forecasts, expert judgment, econometric models, and index models. The Forecast: As of Sept. 14, the PollyVote forecast for the two-party presidential vote is 53.1% for Clinton and 46.9% for Trump.